I was introduced to Yogiiza on my last trip to Miami by a friend. Of course I like to wear colorful things and flowers and bright colors and skulls and clouds. But Yogiiza is different because it carries a natural feel and earthy colors. Something about their brand really caught my eye. Maybe it’s because their spokes-models look gorgeous in their clothes. Maybe it’s the clothes’ fit. They lift without squeezing and hug without suffocating. Organic cotton makes a world of difference on your body and your skin will thank you. I also find Yogiiza’s color choices of various shades of white, blue, green, and brown to be calming and soothing. You can never go wrong with wearing simple, classy yoga clothes made out of cotton. You know when you connect with a yoga instructor and all of a sudden you want to go to all his/her classes? It’s the same phenomenon with Yogiiza! 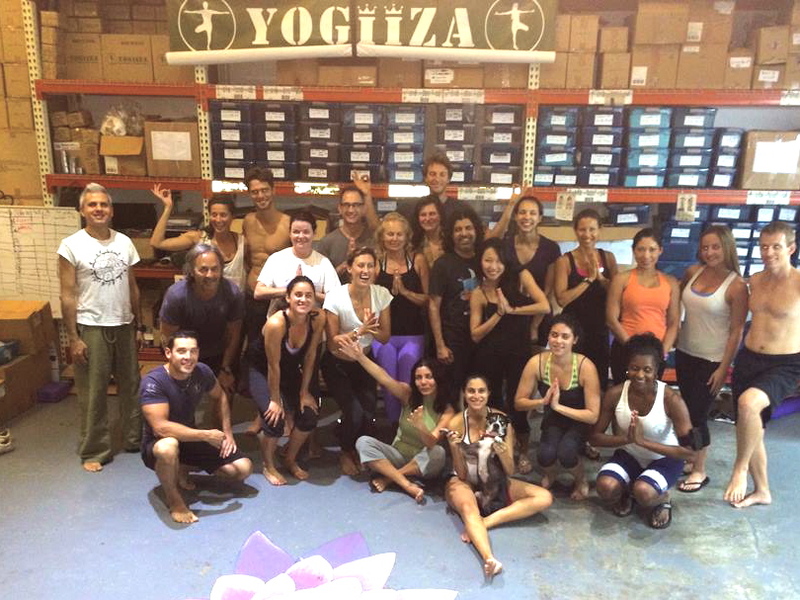 Not only does Yogiiza make great clothes, but it has built an incredible community of yogis in Miami. It’s a cool community to support and mingle with because everyone there is dedicated to yoga but understands that there is a lot more to asana practice and they don’t take themselves too seriousuly.You’ll be greeted at the little warehouse door by smiling faces and a piece of 100% pure chocolate. I like Yogiiza because Mark and Dawn are cool, laid back, and fun. Those qualities reflect on their clothes too. Genuine, comfortable and good looking! I choose to be natural in the way I eat, in how I cure my health and in what I wear. That doesn’t necessarily mean I won’t eat meat or gluten or that I won’t ever wear a pair of Lululemon pants again. But now I’m more conscious of what I wear. I prefer natural fabrics to synthetic ones. Natural is a way of life that applies beyond your clothes. Natural means going back to the roots, connecting to what’s important and simplifying. Natural means striving for balance. Cotton is the most natural thing to be worn on skin. Just as paper and glass are the preferred sources in industries of other kinds. I want to know where my clothes are made just the same way I want to know where my food is grown. Yogiiza clothes are made in Peru and Yogiiza works very closely with their producers. The motto “Live by Yoga” written on the back of the YOGiiZA tees is a good reminder to care for all the choices you make, ranging from your body, your planet and work conditions of people who make your clothes. I have a choice in what to wear, and it does have an impact in other people’s life as well as mine. I don’t just choose to be natural from the inside, but also from the outside. Lately I have invited a more plain, natural look into my life. I used to coordinate all my outfits. Now I just throw on a pair of Yogiiza pants and they match anything. I’m shedding jewelry and I haven’t worn make up in 6 months. I have to carry less stuff around with me,I’m lighter and more free, both physically and metaphorically. The new choice of wearing cotton also translates into feeling more comfortable in my own skin and starting to own my natural features. I finally understand that It’s small imperfections that make people beautiful and I am comfortable with my own imperfections. I have a whole new appreciation for natural hair color too. Nothing beats what mother nature gave us, and wearing Yogiiza organic cotton is as earthy as you can get. And as fashionable as you can be. Read more about Yogiiza and what they do here.